The Connecticut DOT TAMP is available here. CTDOT's initial TAMP was certified by FHWA in July, 2018. The CTDOT TAMP covers NHS pavement and bridge assets as well as all other CTDOT-maintained pavements and bridges. The initial plan includes four additional asset categories: traffic signals, signs, sign supports, and pavement markings. The plan was published in April, 2018. 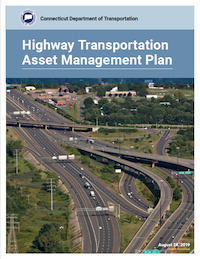 The asset scope of this document is: Highway Assets, Includes other highway assets, Pavement Markings, Sign Supports, Signals, Signs.